The FBI apparently wasn’t the only one recording mob conversations. 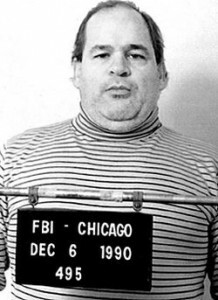 The Chicago Sun-Times reports that FBI agents this week raided the suburban home of imprisoned legendary Chicago mob hitman Frank Calabrese Sr. and found 10 to 15 secret recordings he had made between himself and other gangsters. The paper reported that agents unearthed the tapes from a secret compartment behind a family portrait in the Calabrese family basement in Oak Brook, an upscale Chicago suburb. Calabrese, who is serving a life sentence for mob activities, has been in prison since the late 1990s on various offenses. The paper reported that one tape appears to be of Ronald Jarrett, a burglar and mob killer and Calabrese Sr.’s closest friend. Jarrett was shot to death in 1999 in what remains an unsolved murder. The Sun-Times reported that Calabrese Sr.’s attorney, Joseph “The Shark” Lopez, downplayed the significance of the tapes. “For all we know, it’s Frank Sinatra singing,” Lopez said, according to the paper. Posted: 3/25/10 at 10:47 AM under FBI, News Story.